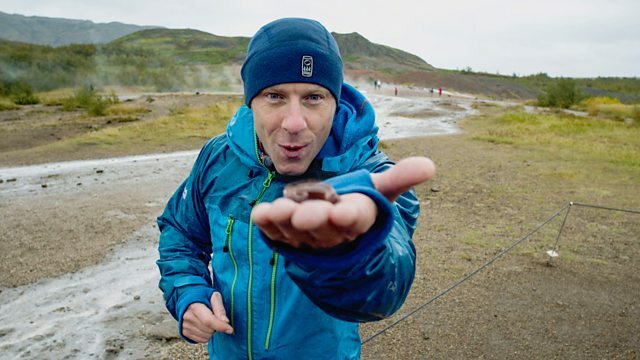 Andy Torbet takes on the world's most heat-resistant animal, as he trys to survive temperatures of 500 degrees Celsius to match the Pompeii worm. Browse content similar to Pompeii Worm. Check below for episodes and series from the same categories and more! if humans had the super skills of animals? grip like the gorilla and swim like a shark? I'm Andy Torbet and this is Beyond Bionic. in the biggest challenge of my life. try and match the most heat-resistant creature on earth. It's time to go beyond bionic. You wouldn't have much marshmallow left after this campfire. skills of one of nature's most heat-resistant animals. That's super toasty, I can feel the heat from here. it's heat of a much more explosive kind. it's called Iceland but it's, like, the opposite, it's superhot. earth in a boiling fountain known as a geyser. -Not that sort of geezer. It's not just volcanoes above ground that create geysers. Underwater volcanoes can create these superhot jets of water, too. Andy, that's a dead worm. Is there a worm doctor in the house? This worm is a very rare specimen used for scientific study. These worms were only discovered in the mid-1980s. Ah, the olden days before mobile phones and the Internet. 2,000 metres below the surface of the Pacific Ocean. The Pompeii worm is one superhot geezer. OK, I get it, this worm is hot stuff. So how are you going to beat it? I'm going to try and survive extreme heat just like the Pompeii worm. So there's only one thing to do. I've got to go beyond bionic. also known as bristle worms because they're covered in hairs. I've got a burning desire to know more, Andy. biologists, and it's one of the most heat-resistant creatures on Earth. during an eruption of Mount Vesuvius in AD79. Life deep under the Pacific Ocean is truly extreme. of water four times hotter than a boiling kettle. But the seawater surrounding the thermal vent is near-freezing cold. What? I don't know whether to break a sweat or start shivering. but their heads poke out into the ocean at a much cooler 22 degrees. That is one extreme hot tub. thermal vents also contain toxic chemicals and molten metal. This is going to be one awesome challenge. and expose myself to some seriously hot temperatures. The Pompeii worm has incredible natural abilities to withstand heat. And it's got me inspired to see if I can do the same. So how are you going to test your heat resistance, Andy? in the intense heat of this Beyond Bionic inferno. So this is like a giant walk-in barbecue. Whoa! You're going to be toast. So I need to search out the science that could help me go beyond bionic. Enabling me to withstand extreme heat, just like the Pompeii worm. First off, I need to find out how heat resistant my body is. Come on, no worm could ever survive in there. And what better way to do that than with a spot of fire walking? And they want me to walk on that. and the skin on our feet is the toughest layer of all. ..my own team of firefighters and medics on site making sure I'm safe. So, in this instance, I have to say, genuinely, don't try this at home. Karen, that was very impressive, how hot is that? On average 660 degrees Celsius. OK, so what sort of temperature would your feet burn at? Your skin on your feet will start burning at round about 200 Celsius. So why don't your feet burn when you walk across this? -very good at transferring the heat onto the source of your feet. your feet will be unharmed. which acts as a barrier to the heat. say dip my feet in water before I started, would that help? and fifth steps, so it really is, "Keep moving." closer, everyone is focused on getting the job done safely. Things are starting to heat up, these embers are now at 660 Celsius. The question is, can I cross them in my bare feet without getting burned? Karen, any last top tips? OK. Time to take the worm on at its own game. Ow, ow, ow, ow, owie! The trick is to keep walking. If I stand still I'll burn my feet. And a Pompeii worm would find this a walk in the park. I think the heat has gone to your head, you're doing it again? You're definitely going to need a pedicure and a foot spa after this. Woohoo! Well done, well done! -Was it anything like you thought it was going to be? seems, quite frankly, a bit mad. your feet aren't even hot, let alone burning. -No, you don't feel the heat. you're going to step on it and your feet are going to burst into flame. never, ever, ever what you expect it's going to feel like. that a human being can actually walk on fire. worm because, this time, I've only exposed my feet to the heat. that will help me face those extreme temperatures head on. This is one heavy-duty worm, but how hot is its competition? I have a feeling it's going to get a bit heated around here. planet, surviving in desert temperatures of up to 50 Celsius. But 50 Celsius to the Pompeii worm wouldn't even raise a sweat. Because these guys could survive in temperatures up to 80 degrees. You can't worm your way out of losing that one, Mr Ant. hunts for its food around 1,500m below the surface. who can be found hanging out at depths of over 2,000 metres. That is one awesome-winning worm all right. Animals really are nature's superheroes and I'm totally in awe. and I like to win. I need their super skills. Stay cool, my friend. How are you going to live like me? it can grow all by itself. Ooh, like a snuggly-warm fleecy coat. Its very own fleecy coat made out of bacteria. perfect food for the bacteria. They grow up to 1cm thick, coating the worm in a thermal blanket. That is so gross and so genius at the same time. Cover yourself in something sticky? Hope some bacteria won't lunch? Grow your own insulating bug coat? as I take on the Beyond Bionic inferno. ..with the firefighters from Manchester Airport. a centimetre-thick coat of bacteria which covers their entire body. against the near-boiling water which the worms inhabit. and that's why I'm dressed up like a firefighter. I've joined firefighter Andy Evans on a training exercise. So, Andy, what am I actually wearing? It basically creates a barrier between you and the heat source. -Insulates you from the fire, yes. use that allows you to approach a fire safely? you to work nice and comfortable for long periods of time. -Can I see that in action? which is used to train firefighters to tackle high-intensity blazes. protective clothing and hose skills to the test. The temperature inside that engine is about 1,000 degrees. The Pompeii worm also uses water to improve its heat resistance. ocean and pumps it around its body, helping to cool it down. The power of this hose is incredible! It can deliver water at a rate of 450 litres per minute. and I'd be in real danger from the flames. my protective wall of water, I could feel almost no heat at all. So, I'd definitely improved my Pompeii worm-like abilities. I wasn't in the heart of the heat. to try and do, so things are just heating up. extreme temperatures, just like the Pompeii worm. If I stand still, I'll burn my feet. the same heat-resistant abilities as this mega minibeast. resist intense heat from a distance. in the Beyond Bionic inferno. Can I survive extreme heat, just like the Pompeii worm? Or will my challenge go up in smoke? This is Somers Forge near Birmingham. over 1,200 degrees to help them melt down iron ore to make steel. than the oven that you or I have at home. In fact, the heat inside there is as hot as lava coming out of a volcano. Wow! But I mean, just think how quickly it could do a pizza. Stood here, I can feel my face almost burning. It's like the hottest day you've ever felt in summer times ten! In fact, it's too hot, I'm getting out of here. and to handle the red-hot metals that come out of it. OK, are they, like, astronauts or something? without the need of some big fountain of water to protect him. could be the key to success in this challenge. This is the X30 silver suit. in heats of up to 1,650 Celsius. Let's find out just how good it is. The heat coming off this furnace is immense! But there's no way I could stand here without this suit on. And to show you just how hot it is, I've brought a snack. Hey... Hey, wait, no, what are you doing? No! What a total waste! Now, that is hot chocolate. Now, THAT is snacktime ruined! I couldn't feel a thing inside the silver suit. So what if we had other worm-like super skills? because you'd be able to stretch your body twice its own length. What if you dived underwater to say ciao to the Pompeii worm? would take around 14 hours. What if you could squeeze into small spaces like the Pompeii worm? You could fit up a drainpipe, if you fancied being a drip. to survive exposure to extreme heat, just like my Pompeii worm friend. very special emergency services training facility in Merseyside. And for good reason, because this is my most explosive challenge yet. I mean, you're playing with fire, literally! And we all know that's real dangerous. I'm fully equipped for this. that protects it from extreme temperatures. This suit can withstand temperatures of over 1,500 Celsius. intense heat in a 360-degree firestorm. At the blast furnace, the heat was only coming from one direction. all around me, just like the worm. inside this - our very own specially constructed Beyond Bionic inferno. just centimetres away in a big fiery vortex. And the heat inside this chamber can rise to above 500 Celsius. Now, that is proper Pompeii worm stuff. So, Andy, run me through exactly what we've got here. We've got three flame bars inside and the base is a giant fan. That is a genius plan. what measures have we got to make sure nothing goes wrong? propane and we'll gradually increase the amount. get it hotter and hotter and hotter. And what do we max out at? What's the highest temperature it will get to in there? -It's going to exceed 500 Celsius. -you back here in a minute. And there are lots of people on stand-by if I need any help. There are paramedics and a fire crew. Without them, I definitely would not be doing this. Even a fire engine, but fingers crossed we won't need this today. Does your mum know you're doing this, Andy? Yeah, you're good. That's it. I'm leaving nothing to chance. And that means, inside the inferno, I can still breathe fresh air. my jacket, my breathing apparatus, my underhood. as the last piece and then my gloves. Oh, my, this is really happening. I can stop this challenge at any time. But this suit is at the cutting-edge of 21st-century protection. I just have to believe in it. Good luck, Andy! Oh, I'm sweating already! It's just me and the flicker of flames. I know, in just a few moments, that will all change. Now it's time to go beyond bionic! in the middle of a fireball, but yet your body is completely protected. The first blast of fire was definitely a shock. but it didn't burn for long. and hit me with a longer burn. Wait, you're doing it again?! Here we go again. OK, a longer burn this time. The suit seems to be able to take more heat for longer. just like the Pompeii worm. I have no idea how this tiny creature does it day in, day out. But you're not doing too bad yourself, Andy! The flames are just flying round me. And it's like standing inside a volcano. the highest temperature and the longest burn. Will my silver suit protect me from temperatures above 500 Celsius? I'm still in one piece. I'm still good. Andy, you cannot be enjoying this barbecue. You're totally on fire, Andy! We should call this show Beyond Crazy Bananas! You're stood in the middle of a fireball but, yet, it is beautiful. You've definitely proven that this suit works. I think the little worm guy would be super impressed. but I couldn't feel any heat at all. It's an amazing bit of tech and it works perfectly. Andy, that was the scariest Beyond Bionic challenge yet! We need to cool you down quick. How about an ice-cold drink? Maybe some ice cream? It's amazing to stand inside what is just a massive fireball. with my version of the Pompeii worm's bacterial layer. So this time, I've matched the power of the Pompeii worm. heat-resistant animals on the planet - the Pompeii worm. to match its ability to deal with extreme heat. I truly went beyond bionic to take on the mighty Pompeii worm. And best of all, I survived. Things are about to heat up on Beyond Bionic as Andy Torbet takes on the world's most heat-resistant animal. Very little is known about the mysterious Pompeii worm, which lives deep under the Pacific Ocean on hydro thermal vents. These vents pump out boiling water heated by underwater volcanoes, so Andy's challenge is to survive intense heat, just like the worm, in a specially built Beyond Bionic inferno. Will he be able to find the technological tools to withstand temperatures over 500 degrees Celsius?